First time on RLC cruise and it was, by far, one of the best damn times I’ve ever had in my life! Loved every band we saw, especially Sammy, Bad Company and Artimus Pyle! Had already booked for VII before we even went on this one and won’t be giving up my reservation for anything! I do agree with another reviewer that the chair reserving/holding on the deck needs to be addressed and the smoking everywhere on deck 11 was a little much. Thank you NAHA for nailing it for us true rockers!! Mary, Talk about a Rock-n-Roll fantasy! This was my 5th RLC out of 6 and will be on the next one in 2019. 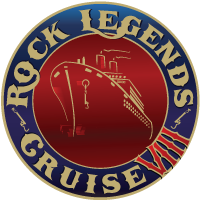 It is the only way to do a cruise and one of the best ways to have an over the top rock ‘n roll experience. There are three venues with shows going on from 10 am to past 12 midnight – every day! Once you’re done for the night, the convenience of your cabin is just steps away. The RLC lineup speaks for itself. There is so much talent, legends and upcoming rockers, on the ship! The people, your fellow rockers, are all there for the same reason – rock ‘n roll! Don’t be surprised if you run into a few rock stars on the elevator or just hanging out watching a show.